The Law Library’s new permanent exhibit cabinet, built into the wall between the Reference and Circulation desks. We are indebted to Robert Emery, J.D. 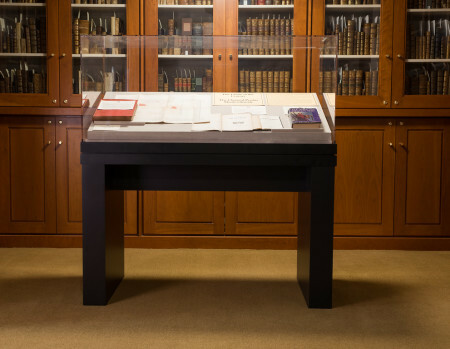 Class of 1980, whose generosity has enabled the Law Library to fulfill its long-nurtured dream of installing a permanent rare book exhibit case. Mr. Emery’s gift also made it possible to purchase a free-standing museum-quality vitrine case for the Rare Books Room. Both cases equip the Law Library to stage secure displays of rare works from Special Collections for students, faculty, and other library patrons and visitors to enjoy as they enter the Circulation area or the Rare Books Room. The unusual opportunity to contemplate such treasures at close range now will be part of the daily GW Law experience. Although the Library has for years mounted exhibitions for special events, it did not have the capability to present its rare materials in displays that could be viewed for weeks or months at a time, since the books were placed in the open on tables and overseen by librarians for the duration of the event only. The new permanent exhibition case, recessed in the wall next to the Circulation Desk on the first floor of the Law Library, is a secure, strategically-lighted, archival-quality cabinet with versatile features which allow display of many different types of materials, including the extremely large folios common in early law publishing. 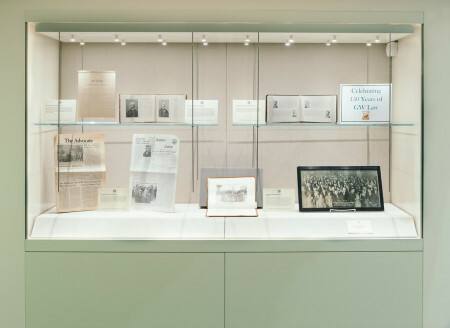 The first exhibit appearing in the new case, “Celebrating 150 Years of GW Law,” includes historical materials such as photographs, student newspapers, and yearbooks, which describe and represent landmarks in GW Law’s history. of Case[werks] LLC (Baltimore, MD), translated the Library’s rudimentary drawings into a simple and elegant yet dazzling case that provides a fitting theater for the rare and unusual works from Special Collections. In addition to the new custom display case, the Law Library has added a second, freestanding case, staged in the Rare Books Room on the first floor of the Library next to the Tasher Great Room. The Gaylord museum series case with ebony-tone base topped by an acrylic vitrine is appropriate for display of any printed material and can accommodate very large works. Its angled mounting deck is especially suited for large folios and makes the cards with commentary text very easy to read.